James Cameron has made a career of mega-ambitious, technology-enhanced productions, most of which achieved unprecedented box-office success. But given carte blanche after 1986’s Aliens, the director took his blank check to the bottom of the ocean, and the money never surfaced back up. Sparing no expense, Cameron led his crew on a grueling 140-day shoot in two specially constructed tanks that drove much of the cast and crew to their physical and mental limits. Despite underperforming at the box office, however, The Abyss remains one of the director’s most personal films, meshing a Howard Hawks-style camaraderie among explorers with the spectacle of Close Encounters Of The Third Kind. Cameron snakes his camera through the behemoth of a cavernous underwater drilling platform, which has been commandeered by a group of Navy SEALS to reach a downed nuclear submarine. Cameron’s obsession with strong women comes in an early shot of military boots stepping off a helicopter followed by a pair of high heels, revealing Lindsay (Mary Elizabeth Mastrantonio). Her mission is to act as liaison between the no-frills (and possibly pressure-mad) SEALS and the ragtag macho crew, led by her ex-husband Bud (Ed Harris). 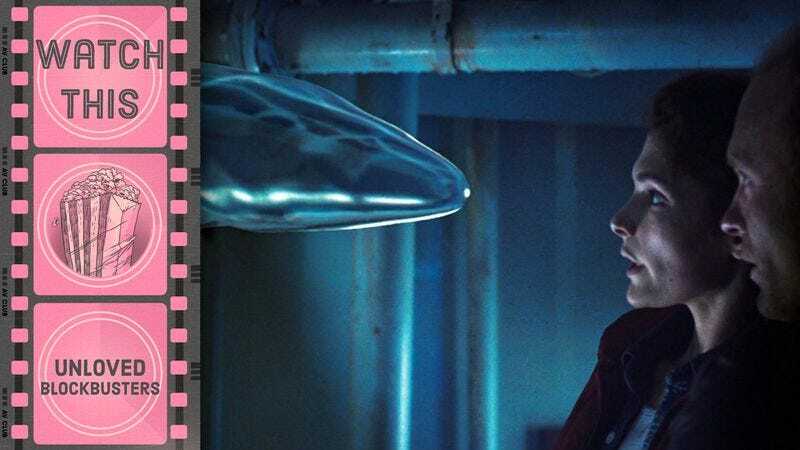 Cameron keeps the narrative loose, pitting his rowdy, tech-lingo-spouting characters against a series of obstacles: a dive to a submarine, an imaginative alien encounter, a close-quarters knife fight, and a wire-cutting climax. But part of what made The Abyss so unique—and why underwater films usually struggle—is the literal sluggishness of its action sequences. The crew buzzes around in small robotic pods, their pace slowed by the water. That might not sound particularly fun, but Cameron effectively captures every bump and turn; it’s a realistically awkward depiction of deep-sea travel. The Abyss has been derided for its rushed ending, a 2001-inspired finale incongruous with the rest of the movie. Cameron “fixed” this in a 1992 re-release with a set piece involving a giant tidal wave hitting Los Angeles, but the additional diatribe about nuclear proliferation contradicts with the director’s fetishism of military technology. Before that final moment, though, when Harris begins to sink down into the darkness, Cameron effectively captures the mysteries that lay below. Availability: The Abyss is available on DVD from Netflix, Amazon, or possibly your local video store/library. Can the love of an enemy agent ever be trusted?